This is what it looked like upon start of the restoration process. The little cow is about to lose it's perch. 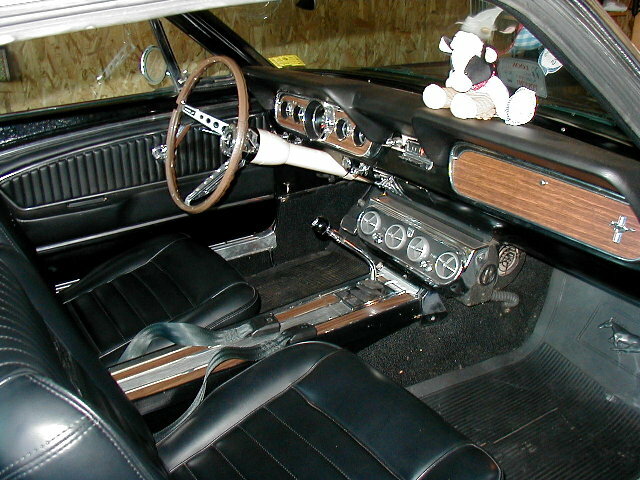 The steering column was already restored during a previous process (see "Steering Column", left) so it was simply removed and stored for the duration. 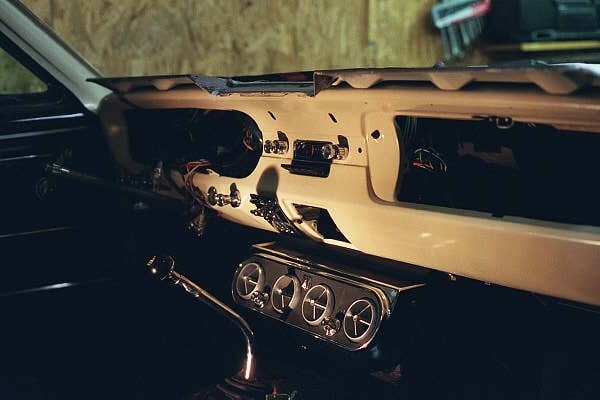 First order of business was to gut the dash of everything but the wiring harnesses. The A/C evaporator was removed shortly after this picture was taken. 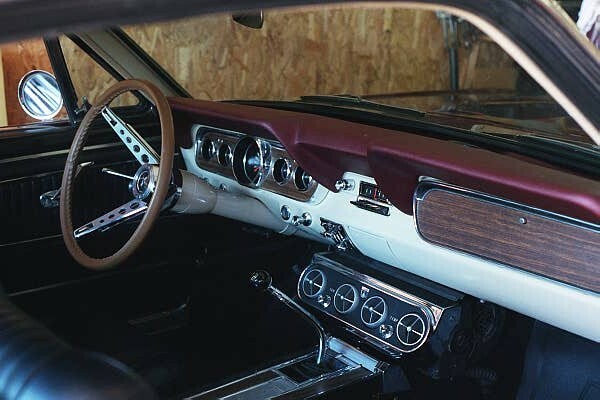 Note the parchment color showing around switch holes and other openings, indicating that whoever painted the interior black simply masked around switches, radio bezel, etc. Started paint removal on the LH side of the dash and A-pillar. The black paint had been simply sprayed over the factory original parchment. In this picture, the windshield has already been removed. Note the parchment around the hole for the fog light switch. Paint removed on the RH side. 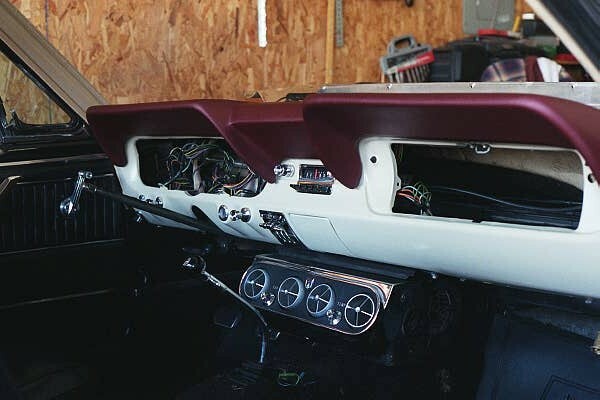 Rather than trying to save the original basecoat, the dash was stripped to bare metal, thereby removing any possibility of contamination from the black paint or primer. The stripping process consisted of brushing on the stripper in small manageable areas, letting it sit for about five minutes, then scrapping it off with a plastic squeegee. Following the stripper, lacquer thinner and #00 steel wool were used to remove the last of paint and primer, as well as any minor surface rust. In this photo, only a small amount of the original parchment remains. Preps for painting then commenced with a prewash of lacquer thinner, masking of the dash, followed by a wipedown with brake parts cleaner and a tack rag. Once it was all checked and declared clean, a coat of light gray lacquer primer was applied. I gave the primer about 30 minutes to dry after which I checked for any surface anomalies and masking flaws. After a wipedown with Prep-All and a tack rag, I shot the parchment using spray can lacquer paint from National Parts Depot. I sprayed about three coats allowing a minute between coats for the paint to flash. It took just over a half of a can to paint the dash and A-pillars. After 45 minutes, I removed the masking, cleaned the area, and quit for the day! Reassembly - I thought out this process very carefully regarding what goes in first, what's next, etc. It's tempting to jump ahead because you're excited about what it will look like with certain items installed. Worst thing is having to remove something you so hastily installed. The potential for damage is great! Patience here pays big dividends later on. Reassembly commenced with installation the switches, the cleaned-up heater control assembly, radio, and the A/C evaporator. I refurbished each assembly as best I could before installation. Since the A/C was void of freon, I also removed the hoses and flushed out the system using brake parts cleaner and compressed air. Continuing, ashtray, windlace, and dashpad are installed. 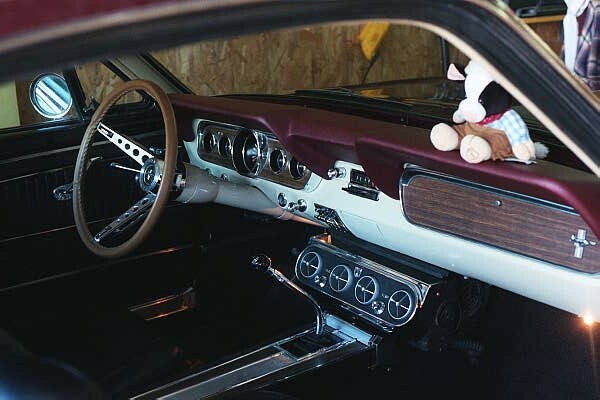 The maroon dashpad, a repro piece, was very well constructed in all areas except where the defroster ducts and the radio speaker go. 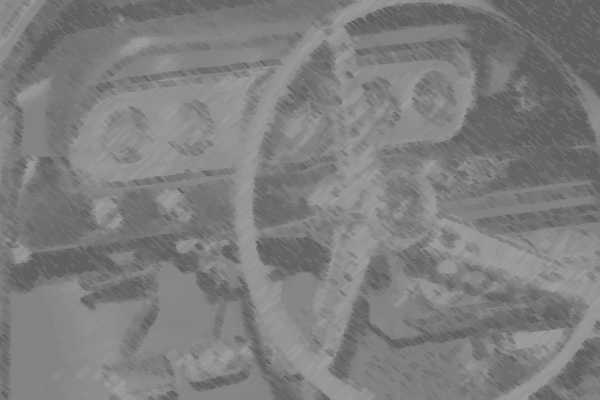 Compared to the picture above, the dash appears white - the effect coming from outside light versus a halogen light bulb. Almost done! The glove compartment, instrument cluster, and steering column have all been reinstalled. Also installed is the windshield, rearview mirror, sun visors (not visible), and console. COMPLETED! The lower windshield moulding is the final piece installed after the radio speaker and speaker grille. The battery was reconnected and the little cow is back on it's perch. Kick panels, door panels, carpet (excluding folddown carpet), and seats were not changed. They will remain black until time and funds become available in the future.